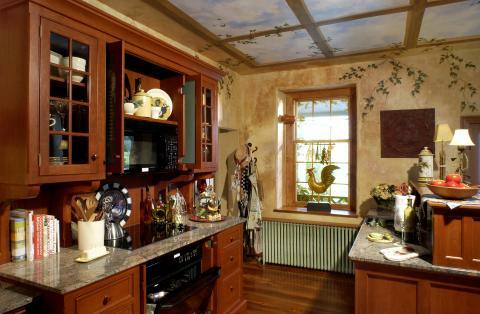 This Tuscan inspired Show House kitchen in an old stone farmhouse is only 13′ x 13 ½’ and features three super efficient unfitted YesterTec Workstations that allow the three doors, two huge windows, radiators and a large fireplace to remain intact, and there is even room for a breakfast table and a desk (in the fireplace!). Installing continuous cabinetry and counter tops simply could not have been this successful in preserving the room’s integrity. 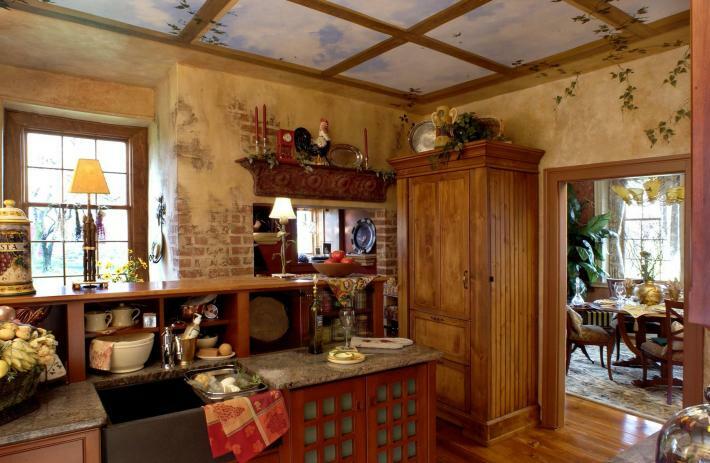 The outstanding Trompe l’oeil ceiling and wall paintings seemingly places this furnished kitchen under a unique Tuscan trellised garden pavilion. 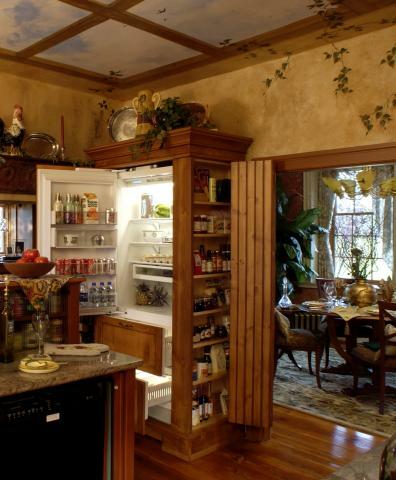 The advantage of three dimensional furniture is evident in the distressed pine Subzero refrigerator workstation (SZ) with its side opening one-can-deep pantries. The side opening pantry doors are disguised as bead board paneling. The storage options are available in several sizes. 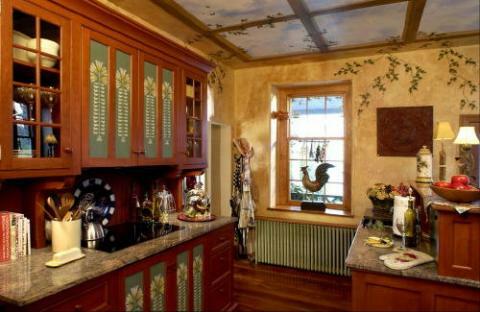 The freestanding range and sink workstations are Hampton’s Cherry w/ granite and solid cherry tops. The Custom Stenciling pattern on the flipper doors that safely conceal the oven and microwave/hood make this piece completely unique! Note how the various materials, finishes and styling of the furniture have no problem coexisting, mostly due to the strong finishes of the room’s wall, floor and ceiling that meander between each piece. This variety would be impossible to achieve using standard built-in cabinetry, especially in such a small room that is interrupted with so many wall openings. By the way, the range piece has moved three times and now resides in our showroom here in Catasauqua, PA. So come and see it! Previous ArticleDesigner’s Show House Kitchen moves three times!